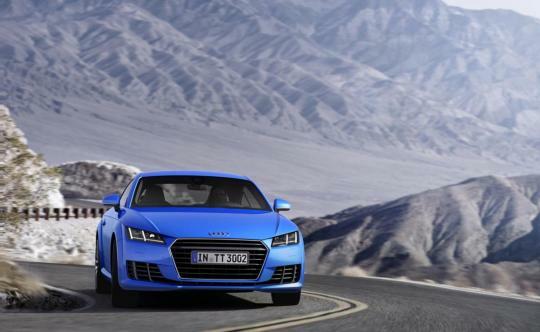 Here's the new Audi TT. The third-generation of Audi's two-seat sports car made its debut under the lights at Volkswagen's all-encompassing Group Night. Drawing inspiration from both the original TT and the Audi Sport Quattro Concept, the new TT is more of an evolution of the second-generation's look, wearing the same basic shape. 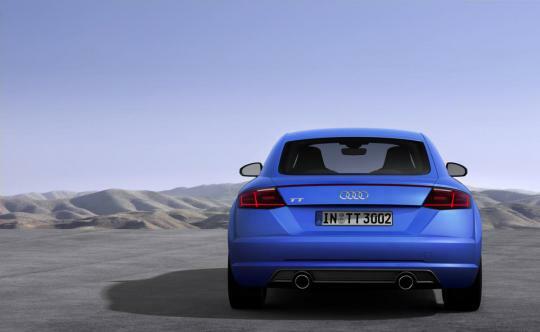 The rear is reminiscent of the first TT, with the rounded look of the fenders and taillights meeting with the roofline to offer a stylish form factor that's accented by a subtle set of twin exhausts. As with the gen-two car, that sloping rear hides a spoiler that deploys automatically at 75 miles per hour. The front, meanwhile, with its sculpted grille and headlights, reminds us quite forcibly of Audi's heritage-inspired concepts, the Quattro and the aforementioned Sport Quattro. Under hood, there will be three powertrains available. The base is a 2.0-liter, TDI four-cylinder with standard stop-start that churns out 184 horsepower and 280 pound-feet of torque, all while returning in a hugely impressive 56 miles per gallon. It'll hit 100km/h in a reasonable 7.2 seconds. The TT with the TDI mill is only available with front-wheel drive. The two engines we're most likely to see stateside are variations of Audi's popular 2.0-liter, turbocharged four-cylinder. The base engine delivers 230hp and 272lb-feet of torque, which can be delivered through either a 6-speed manual to the front wheels or through a 6-speed dual-clutch S-Tronic to a Quattro all-wheel-drive system. As with the TDI option, the past several years of TT indicate that we shouldn't count on a FWD, manual-trans model. Equipped with the 6MT, drivers can expect to hit 100km/h in 6 seconds, while the DCT/Quattro model can get there in a scant 5.3. Both cars are limited to 250km/h. 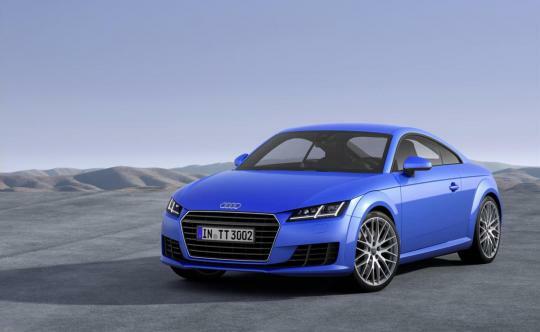 For those with a heavier foot, Audi's second-generation TTS should fill the bill, offering up 310hp and 280lb-ft of torque from its 2.0T. A six-speed manual will be available as standard (again, probably not for the US) while a six-speed S-tronic will also be available. 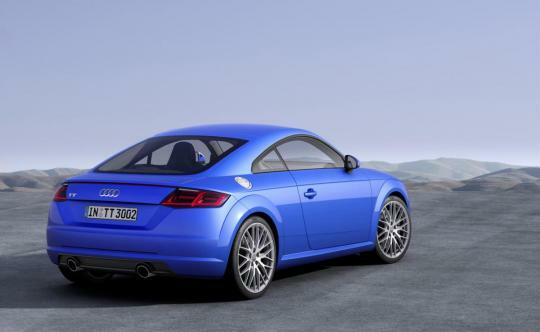 100km/h arrives in just 4.7 seconds, meaning it's just 0.6 seconds slower than the limited-run TTRS. 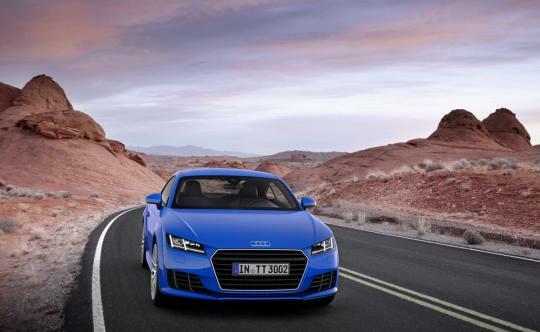 At this point Audi is simply updating the headlights and taillights of cars designed by Peter Schreyer 10 years ago. So when you see impressive designs from Kia and Hyundai and see fairly safe updates by Audi you will know that one man can make a difference and the loss of that man to a competitor can make a difference. Nothing special outside. But the new virtual cockpit caught my attention. The ultimate in lazy design - from the back it looks crazily identical to the current model. The grill, which is the only bit that looks different at all (if you were to ask me), borrows heavily from the Hyundai i30. That means it still looks ugly and I'd much prefer a Scirocco if I was going to buy any VAG product at all. Is Lamborghini the only marque under the VAG group that has a new design - and not an extensive facelift - for a new model? Although the life cycle is pretty long compared to other cars..
Love everything about this car especially the interior and LCD dash.. i think this model will last another 10 years. It really shines in its interior, and let’s face it, no matter how good a car exterior is, buyers will spend time looking the inside more than outside. The Huracan seems to have a similar digital dash as the new TT.. hmm..